This Italian Chicken, Peppers and Sausage recipe was originally posted in November of 2015, but has been updated with new pics and recipe details. Guys, I can’t tell you how many times over the years I’ve made this chicken and sausage recipe. It’s been a lot…and for good reason —>it’s absolutely delicious! It’s straight up comforting right to your bones. Italian sausage and peppers is such a delicious combo. Then, adding chicken thighs and potatoes really adds extra ooomph. This stick to ya ribs comfort food classic is easy to make and perfect for entertaining or Sunday supper (my fave). Imagine enjoying a bowl of this with lots of parsley, freshly grated parmesan cheese and a nice glass of vino? Making you hungry, right? Of course, this is a meal in itself, but you can never go wrong with some crusty bread. Speaking of which, my local grocery store has the most AMAZING bakery, you guys. I even know roughly when their bread comes out of the oven. Weirdo, huh? As soon as I pull in on the parking lot, the smell of freshly baked bread wafts through the air. Someone should bottle that. Seriously. Ummmmm, lady,…..as if that’s a problem!!! And, then if you happen to make this delicious chicken and sausage recipe, you’re in foodie heaven right there, my friends. 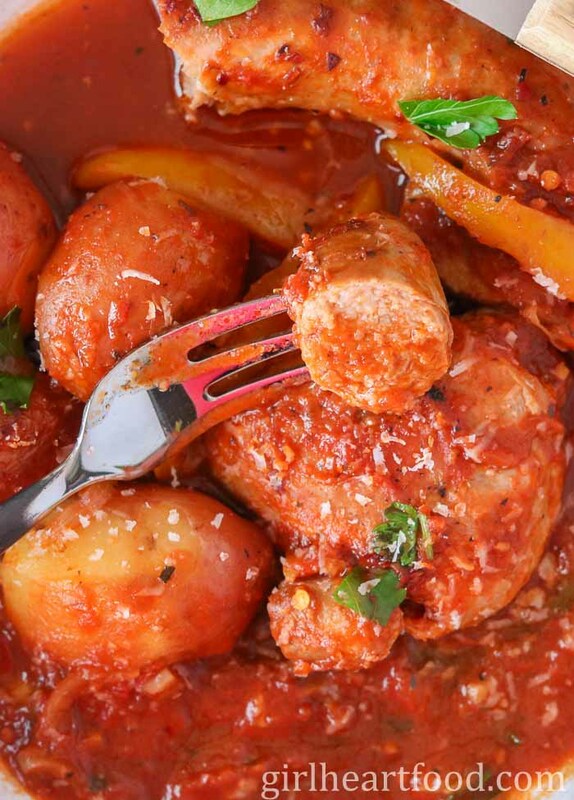 So, What Goes in this Italian Chicken and Sausage Recipe? Roast the baby potatoes (I love baby red potatoes in this recipe). Roasting gives them a start and they’ll finish cooking in the red sauce. Meanwhile, cook the chicken and sausage and then lay to one side (you are simply browning, not fully cooking at this point). The chicken will release when it gets a little colour on there. Trust the process. Cook onion for a minute or two. Deglaze pan with stock or wine. What’s deglazing, you ask? Basically, it’s using a liquid (usually, wine and sometimes something like stock to remove the stuck on brown bits (aka flavour bombs) on the bottom of the pan. Add peppers, mushrooms, cooked potatoes and spices and cook a bit. Pour in tomato sauce and add chicken and sausage. Basically, after a bit of prep, you kinda just put the cover on and let the magic happen for about 30 minutes. Before you’ve had a chance to finish a glass of wine, supper is ready. The ingredients themselves are quite simple and probably stuff that you already have on hand. What Goes with this Chicken, Sausage and Peppers Recipe? What’s the Best Chicken for Cooking? When is Chicken Cooked? For a longer cooking time, I always opt for chicken thighs. They have lots more flavour, in my opinion, than chicken breasts. Plus, they can withstand longer cooking times and still remain juicy and delicious. The chicken thighs are cooked when the juices run clear (when chicken is pricked) and the internal temp at the thickest part of the chicken is 165 F. If there are any signs of a pinkish hue in the juices, it’s not done. Cook a little more until juices are clear! 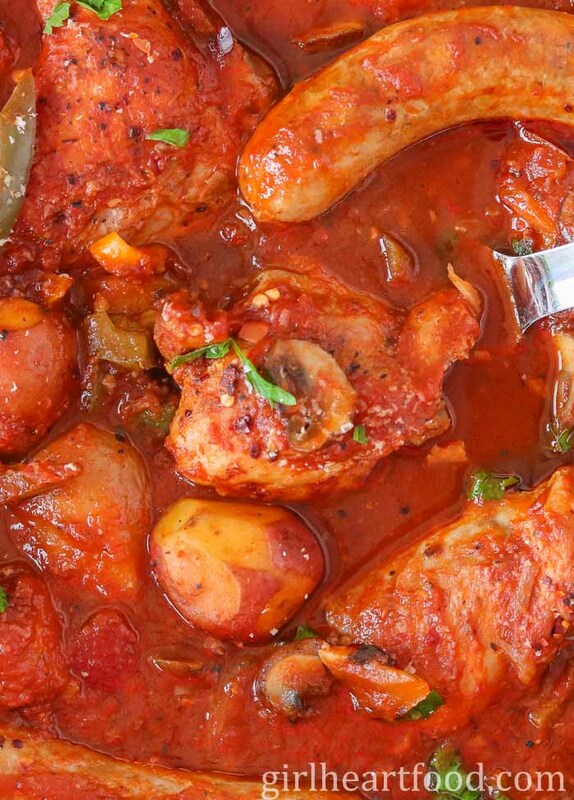 Can this Italian Chicken and Peppers Recipe be Reheated? Totally! This recipe yields enough for 4 people (each with a piece of chicken, sausage, some peppers, potatoes and sauce). If you are cooking for two, just store leftovers in the fridge and gently reheat on the stovetop the next day. Enjoy leftovers within 3 days. Can I Add the Sausage and Chicken into the Red Sauce without Browning? Sure! If you’d rather not brown the sausage and chicken, that’s a-ok. You may have to cook a little longer in the red sauce until both are cooked. As mentioned above, chicken should be 165 F and the juices to run clear. Sausage should be at least 160 F.
How Should I Garnish this Sausage Skillet? Herbes de Provence is a mixture of herbs, like rosemary, thyme, basil and the like. You can buy store-bought versions in your grocery’s spice section or make your own. Not into that? Just use an equivalent amount of what you have, preferably thyme, rosemary and/or basil. If you want to go more of a traditional Italian American red sauce route, then just use a little oregano. Oregano is quite potent, so I’d start with 3/4 tsp and see how you feel about that. Like the red sauce thicker? Take the cover off half way through cooking time to allow the sauce to reduce a bit. Because the tomato based sauce is such a predominant component in this recipe, use a good quality can of tomatoes. I really love ‘san marzano’. The Italian sausage were left whole, but you could cut into bite-sized chunks if you’d rather. The amount of salt I used was just right for my taste buds. Depending on the brand/amount of salt in the can of tomatoes you use, the seasoning may need to be adjusted to your taste. I cut the bell pepper into strips, but you could also cut into bite-sized chunks. Use whatever colour of bell pepper you have on hand. Speaking of bell peppers, I enjoy them on the softer side in this recipe. If you like them with a little more bite, don’t add them in until the last 10-15 minutes of cook time. Want to infuse even more flavour into this dish? Throw in a small rind of parmesan into the pan when you add the tomato sauce. Discard when cooked. Hope you love this easy chicken and sausage recipe as much as we do! 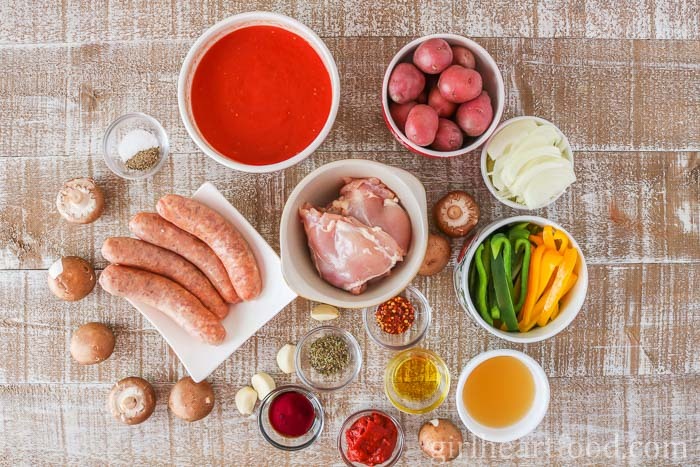 This easy Chicken and Sausage Recipe combines hearty chicken thighs, Italian sausage, loads of bell pepper and baby red potatoes. 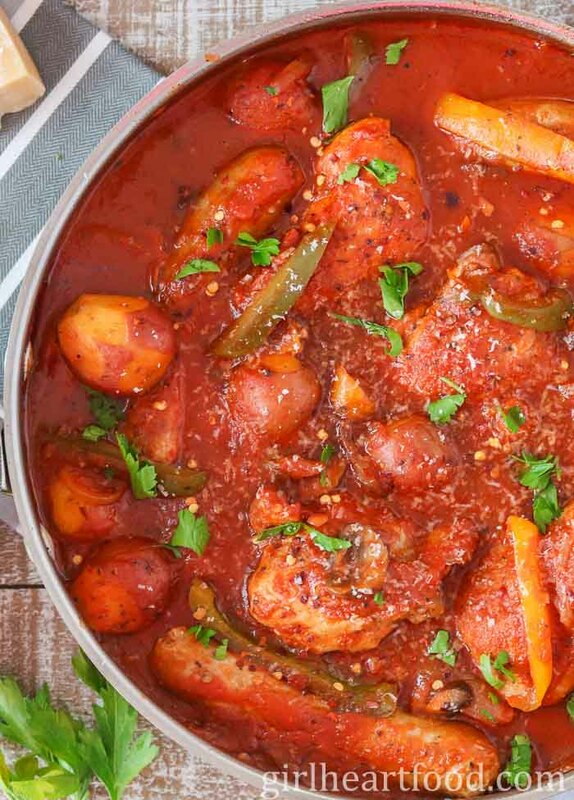 It's all cooked in an easy red sauce for one comforting meal you and your family will love. 1 lb baby potatoes -I left most of the skin on (about 12-14) and removed eyes. Preheat oven to 400F. Season baby potatoes with 1/4 tsp each of salt and pepper and 1 tbsp. of olive oil. Cook in a cast iron pan for 20 minutes. Lay to one side when done. Meanwhile, season chicken thighs with 1/4 tsp each of salt and pepper. Heat 1 tbsp. of olive oil on medium low on a large sauté pan. Brown chicken for 5-7 minutes on each side for about 10-14 minutes total. Remove from pan and place on plate for use shortly. Add sausage to pan and brown 2-3 minutes per side, for about 4-6 minutes total. Remove from pan for use shortly. Remove any excess oil from pan. Add 1/2 tbsp. of olive oil. Cook onion until for 1-2 minutes. Deglaze with stock (scraping up any brown bits from chicken/sausage) and cook until stock reduced by half, about 5 minutes. Add garlic and cook for 1 minute more. Add peppers, mushrooms, cooked potatoes, herbs, chili flakes, 1/2 tsp each of salt and pepper. Cook for about 3-4 minutes. Make a little hole in the centre of the pan by pushing veggies to one side. Add tomato paste and stir to combine. Add tomatoes to pan. Stir. Place reserved chicken and sausage (and any juices) on top of pepper mixture , cover, tucking into the sauce. Bring to a medium simmer. Cover and cook on medium low for about 30 minutes, stirring halfway so sauce doesn't stick to bottom of pan. Stir in balsamic vinegar. Season with additional salt and pepper, if desired. Serve each person a sausage, a thigh and some potatoes, peppers/sauce over creamy polenta, grits or gnocchi (or enjoy as is with a hunk of bread). Garnish with parsley and parmesan. Enjoy! Herbes de Provence is a mixture of herbs, like rosemary, thyme, basil and the like. You can buy store-bought versions in your grocery's spice section or make your own. Not into that? Just use an equivalent amount of what you have, preferably thyme, rosemary and/or basil. If you want to go more of a traditional Italian American red sauce route, then just use a little oregano. Oregano is quite potent, so I'd start with 3/4 tsp and see how you feel about that. Because the tomato based sauce is such a predominant component in this recipe, use a good quality can of tomatoes. I really love 'san marzano'. The Italian sausage were left whole, but you could cut into bite-sized chunks if you'd rather. Speaking of bell peppers, I enjoy them on the softer side in this recipe. 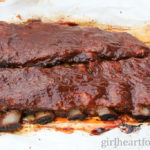 If you like them with a little more bite, don't add them in until the last 10-15 minutes of cook time. Want to infuse even more flavour into this dish? Throw in a small rind of parm into the pan when you add the tomato sauce. Discard when cooked. I know that fresh bread smell you speak of. And yes, it should be bottled. I would definitely need some bread (even if it’s gluten-free) to soak up that amazing sauce. Looks so yummy, Dawn! This is such a nostalgic recipe to me. I remember my mom used to throw sausages, chicken, potatoes, tomatoes and peppers in a roasting pan, cover and let it simmer all day in the oven. This totally reminds me of that. Love it! Dawn, this is making me so hungry! The sausage and peppers must give it such a wonderful flavor. Rustic, hearty, and simple – comfort food at its finest. And with a warm loaf of bread…..Heavenly! Totally agree! Thanks so much, Kelly! If I’m thinking of the same bakery, I totally agree that it is amazing! I’ve been trying to cut back on grains, and staying away from bread is a challenge. It is my weakness. Give me some bread, butter and wine and I’m in heaven. Add this comforting chicken and sausage dish, and I’m all set. This is hearty and flavourful, and perfect for our continuing winter weather! You know what one I’m talking ’bout 😉 Thank you Leanne! We need all the comfort food we can get, don’t we?! I love everything about this dish. So much delicious going on in one beautiful casserole. A perfect winter comfort meal. Yum! Yay! Thank you very much, Colleen. You always make me smile, Dawn! “No matter, I’m going to eat it with my hands when I get home anyway…” Love it! Girl after my own heart! And hello gorgeous comfort food! Love that it’s made with chicken sausage! My favorite type of meal is one like this! One pan, super comforting and packed with delicious and hearty flavors. I think it’s so awesome that you know when the baked goods come of out the oven at the bakers! Brilliant. It’s all better when it’s still warm, right!? 🙂 Lovely recipe, Dawn. Dawn – this looks like one of the best Sunday meals ever! I love the addition of the sausage to the chicken, peppers and tomatoes. And I totally agree, some crusty bread is the only other thing you need. A big pot of food to last at least a couple of meals – all I ever want on a Sunday! Thanks! Pinning! Yum! Would love a huge bowl with some fresh bread. Then will fully dedicate myself to it:) Such gorgeous color too. Pinned for inclusion in our March weekend menu! Thank you Milena! Hope you guys love it! So happy to hear that, Jennifer! Thanks so much and enjoy! This looks amazing! 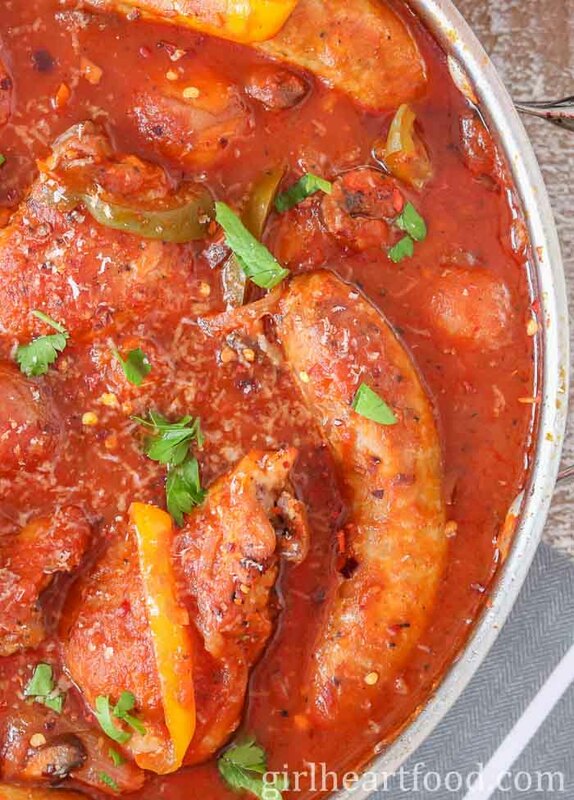 This dish has some of my favorite foods – chicken, sausage and peppers! Your updated pics look amazing! Thanks so very much, Kathy!! This is my kind of recipe Dawn! In fact, my entire family would demolish it in minutes. Loaded with all our favorite ingreiendts and so nice and hearty. Pinned! We’re in the middle of moving a TON of furniture, and painting, and I’m just wishing you lived nearby so I could pay you to come bring me a giant vat of this, haha! It is JUST what I need. Hearty, comforting and filling. Mmmm!!! When I hear “too hot to slice” I think perfect, because I always tear off the first piece in the car anyway–I don’t wait to get home to eat bakery bread! This sounds like a perfect dinner to me, especially with some crusty bread on the side :). Have a great week, Dawn! I know, right 😉 ?! Thank you Kelsie. You too!